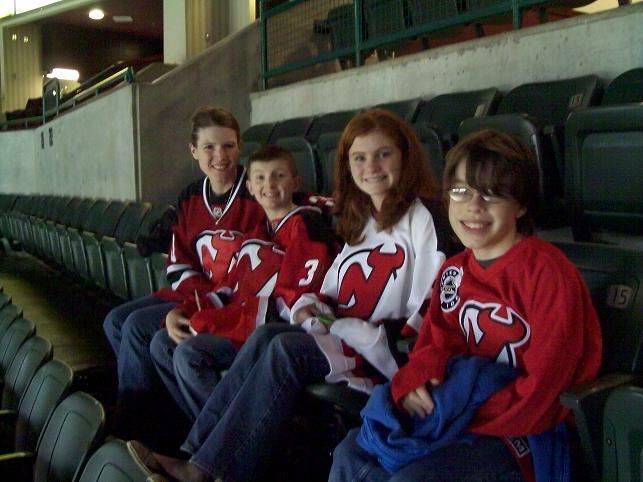 In our quest to find 'something to do', we decided to pile the gang into the car on this Sunday afternoon and head to Trenton to watch the Devils game versus the Reading Royals. We had been wanting to get here since it was 'on the list', and afterwards we're glad that it's checked off the list. 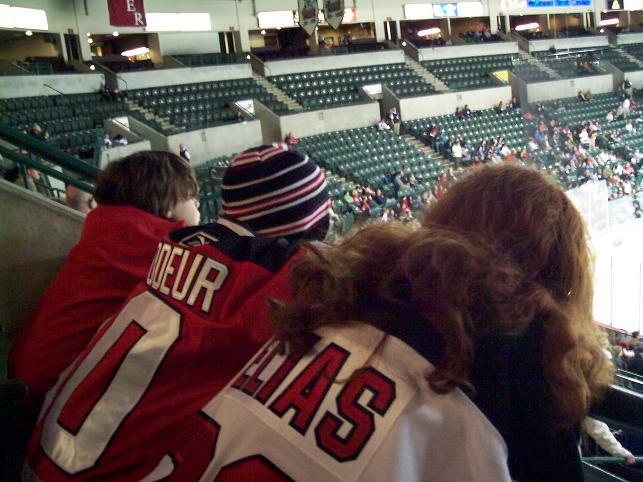 It was a pretty non-descript rink, with very few fans there to watch the game. Even though the place is only about ten years old, it's obvious that they don't take good care of the building. Much like the baseball stadium in Trenton, this is not a place we would go out of our way to get to again. If we happened to be 'in the area' for some strange reason we might, but it wouldn't be worth another drive to Trenton. After the game, we indoctrinated Sara and Andrew in the Chickie's and Pete's world, hitting this fine establisment in Bordentown, New Jersey. This also completed Jill and I's tour of this small chain, as we had been to all six of the Chickie's and Pete's locations after this visit! We drove back to Binghamton after dinner. 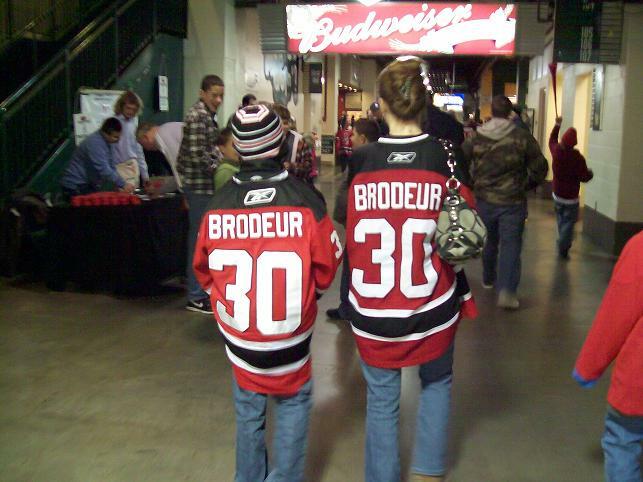 Trenton, NJ - The Trenton Devils can't seem to find a way to solve the Reading Royals, dropping their seventh decision of the season series, 4-3, in overtime at the Sun National Bank Center Sunday night. The Devils (10-14-3-4) were coming off of a 3-2 victory against the Johnston Chiefs Saturday, snapping a five-game losing streak, but fell back into old habits with defensive lapses, letting the Royals skate away with their third win after regulation. Marc Cavosie netted the game winner at 3:07 in overtime, his fourth of the season, to help improve the Royal's record to 18-10-1-2. Ryan Cruthers recorded one goal and three assists, notching helpers on each of Olivier Labelle's two goals. Reading jumped out to a 1-0 lead at 7:24 of the first. Labelle controlled the puck off the boards and beat Gerald Coleman with a shot from above the left circle. Nick St. Pierre and Ryan Cruthers assisted. Although the Devils failed to connect on two opportunities with the man advantage in the first they produced several scoring chances and were perfect on two penalty kills. Coleman kept the game tight with some show-stopping saves during a late first period Reading flurry. The Royals made it 2-0 at 6:42 of the second period when Cruthers redirected a point shot from Eric Werner through traffic and into the back of the net. Trailing by two midway in the second, Trenton again demonstrated its comeback ability, finally solving Reading netminder Andrew Engelage. Chris Poli fed the puck down to Kyle Kucharski in the slot and he buried it short side for his seventh of the year at 11:55. The assist was Poli's fifth in as many games, and first of two on the night. Justin Coutu had the secondary assist, his fifth of the season. Despite tossing 22 shots towards Engelage in the second, a season high, the Devils fell behind 3-1 when a coast-to-coast rush fro Labelle caught the defense off-guard and a soft shot squeaked through Coleman at 17:18. Trenton's strong play finally turned into scoring in the third. With the Devils on the powerplay, Jack Combs collected a pass from Chris Poli at the right post and swept the puck through the crease. The puck redirected off a Reading defender in front and bounced in making it 3-2 Royals at 4:35. Just one minute later, Kyle Kucharski made a strong transition play at the Devils blue line, passing ahead for Kory Nagy who found Ryan Ginand coming down the slot all alone. Ginand beautifully brought the puck from his forehand to his backhand to fool Engelage glove side and tie the game, 3-3. It was the first North American-professional goal for the rookie from Northeastern. The teams exchanged scoring chances in the second half of the third, but neither could put the game away in regulation. With Justin Coutu in the penalty box for high-sitcking at 2:25 of the extra period, Marc Cavosie's hard slapshot from the point blew by Coleman inside the short post to give the Royals the 4-3 win. Andrew Engelage made 45 saves for his fourth win, while Coleman stopped 29 shots, now 5-6-2-3 on the season. The Devils host the Johnstown Chiefs on Wednesday at 7 p.m.